Co-owners CEDIA and InfoComm International celebrate record attendance at ISE 2016 with a 10.7 percent increase over 2015. Officially the largest AV and systems integration tradeshow in the world, visitors had the opportunity to marvel at the industry's latest technologies and products, enjoy an extensive education program designed by CEDIA, and witnessed a closing keynote by physicist and futurist Dr. Michio Kaku. 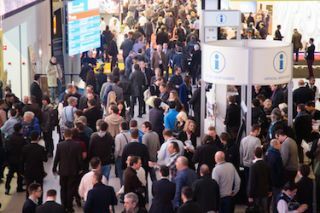 "1,103 world-class companies and more than 65,600 attendees from all over the world visited ISE this year, showcasing the strength of a growing industry," said Vin Bruno, CEDIA CEO. "CEDIA and InfoComm are proud to own Integrated Systems Europe and deliver the industry's largest and most successful show." CEDIA training courses for ISE 2016 encompassed 32 sessions over five days, with topics that included innovations of the home technology industry led by CEDIA's Dave Pedigo, as well as immersive home cinema audio, advanced networking, lighting control, hi-resolution audio, and more. "We seek to provide all professionals with the most comprehensive and timely information, and we want to ensure that best practices are communicated and implemented consistently across the industry," Bruno added. With the close of another successful ISE show, CEDIA looks forward to its annual show at the Kay Bailey Hutchison Convention Center in Dallas, TX, September 14-17. Nearly 350 exhibitors have already confirmed booths at the show, including Barco, Clare Controls, Comcast, Control4, Dish Network, Dolby Laboratories, Lutron Electronics, Meyer Sound, Savant, Sony, and Vantage Controls. In addition to home technology professionals, CEDIA's annual tradeshow welcomes attendees across many key industry verticals, including contractors, architects, builders, interior designers, engineers, installers, sales, marketing and many others.